As has been the case for more than two decades of Pew Research Center surveys, women are significantly more likely than men to associate with the Democratic Party. 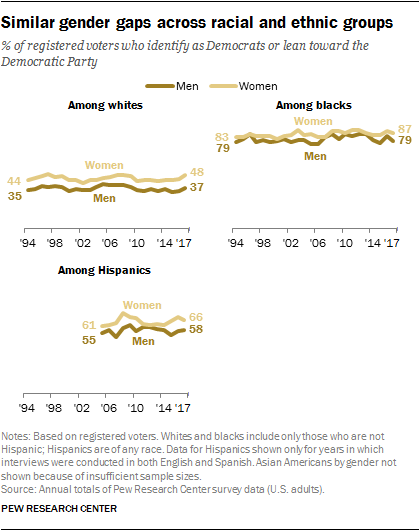 While the gender gap has changed little in recent years, it is as wide as it has been at any point during this period: Among registered voters, 56% of women affiliate with or lean toward the Democratic Party, compared with 44% of men. From 2010 through 2015, about half of women (51%-52%) identified with or leaned toward the Democratic Party. But the share of women who identify with or lean to the Democratic Party has risen in recent years, to 54% in 2016 and 56% in 2017. The partisan breakdown of men is relatively unchanged over this period. The Democratic gains among women have not come from increased affiliation with the party. 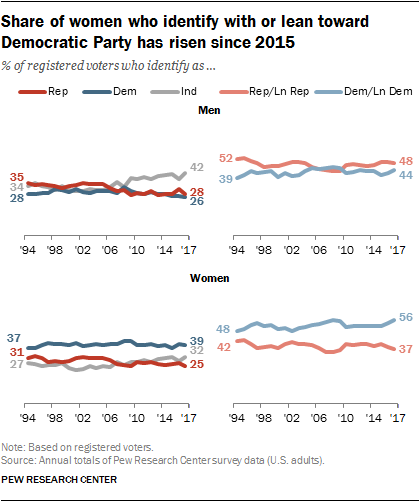 Overall, the proportion of women voters who identify with (rather than lean toward) the Democratic Party has remained relatively constant for the past 25 years (in 1994, 37% of women said they identified with the Democratic Party, compared with 39% in 2017). Higher educational attainment is increasingly associated with Democratic Party affiliation and leaning. 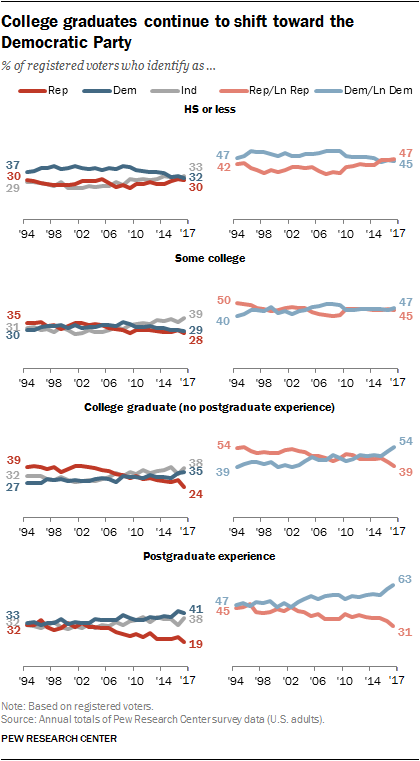 At the same time, those without college experience – once a group that tilted more Democratic than Republican – are roughly divided in their partisan orientation. 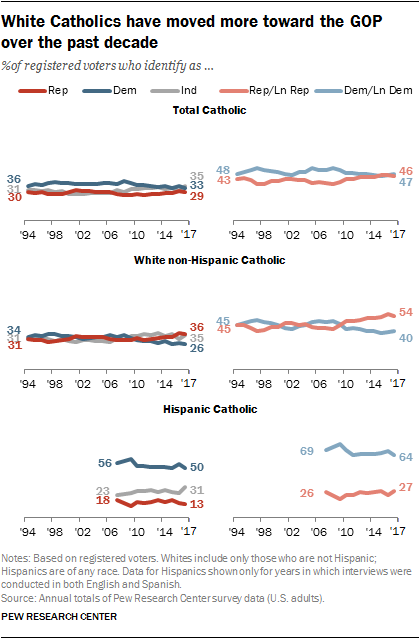 These twin shifts have resulted in the widest educational gap in partisan identification and leaning seen at any point in more than two decades of Pew Research Center surveys. Democratic gains have been even more pronounced among those who pursue postgraduate education. In 1994, those with at least some postgraduate experience were evenly split between the Democratic and Republican parties. Today, the Democratic Party enjoys a roughly two-to-one advantage in leaned partisan identification. 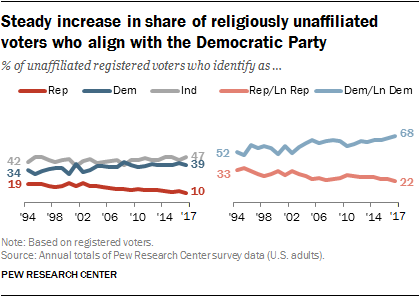 While some of this shift took place a decade ago, postgraduate voters’ affiliation with and leaning to the Democratic Party have grown substantially just over the past few years, from 55% in 2015 to 63% in 2017. By contrast, Republicans have been gaining ground over the past several years with those who do not have bachelor’s degrees. 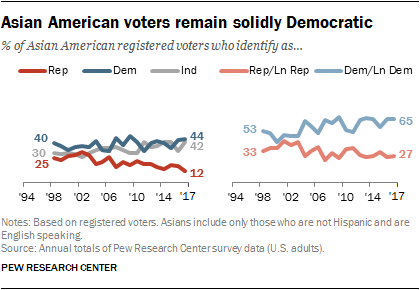 Among those with no more than a high school education, 47% affiliate with the GOP or lean Republican, while 45% identify as Democrats or lean Democratic. 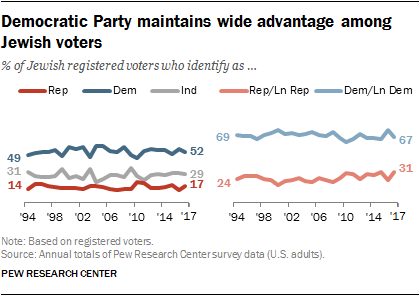 Democrats held a significant advantage among voters with a high school degree or less education for much of the late 1990s through early 2000s, and as recently as 2014 (47% Democratic, 42% Republican). These overall patterns in education and partisanship are particularly pronounced among white voters. While the GOP has held significant advantages over the Democratic Party among white college graduates without postgraduate experience over much of the past two decades, these voters are divided in their partisanship today. 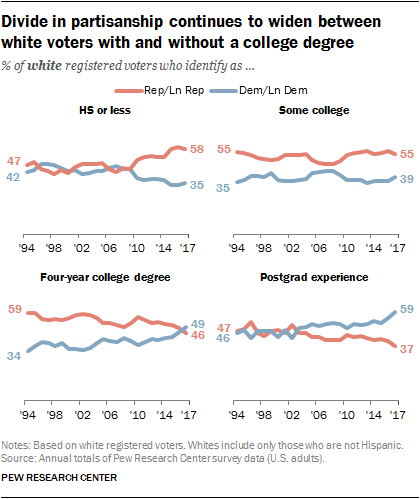 In 2017, 49% of white voters with a college degree (and no additional education) aligned with the Democratic Party, compared with 46% for the GOP. As recently as 2015, 51% of white voters with a college degree aligned with the Republican Party, compared with 43% for the Democratic Party. And among voters with postgraduate experience, the Democratic advantage has grown. 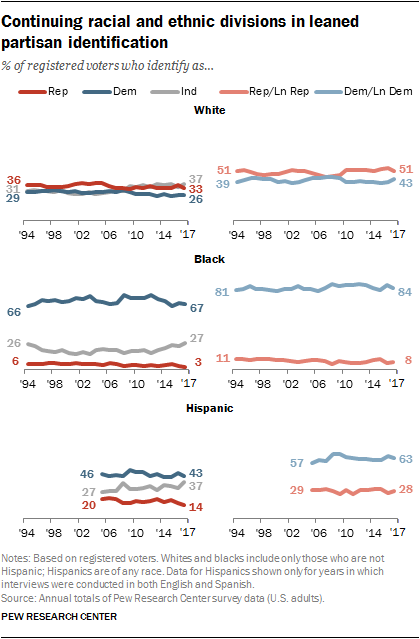 In 2017, 59% of white voters with at least some additional education beyond a four-year degree identified as Democrats or leaned Democratic, while 37% identified with or leaned toward the Republican Party; as recently as 2015 that balance was slightly narrower (52% to 41%). By contrast, white voters with no more than a high school education have moved more to the GOP over the last 10 years, though there has been little change since 2015. As recently as 2009, these voters were divided in leaned partisanship. Since then, Republicans have held significant advantages, including a 23-percentage-point lead in 2017 (58% Republican, 35% Democratic). 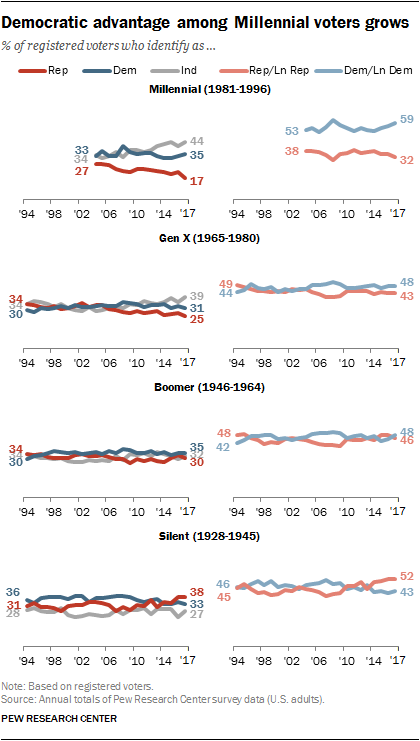 The generational gap in partisanship is now more pronounced than in the past, and this echoes the widening generational gaps seen in many political values and preferences. Millennial voters (born 1981 to 1996) have had a Democratic tilt since they first entered adulthood; this advantage has only grown as they have aged. Democrats enjoy a 27-percentage-point advantage among Millennial voters (59% are Democrats or lean Democratic, 32% are Republican or lean Republican). In 2014, 53% of Millennial voters were Democrats or leaned Democratic, 37% tilted toward the GOP. Millennials remain more likely than those in older generations to call themselves independents (44% vs. 39% of Gen Xers, 32% of Boomers and 27% of Silents); still, the roughly two-to-one Democratic advantage among Millennials is apparent both in “straight” and “leaned” partisan affiliation. Generation X voters (born 1965 to 1980) are more divided in their partisan attachments, but also tilt toward the Democratic Party (48% identify as or lean Democratic, 43% identify as or lean Republican). 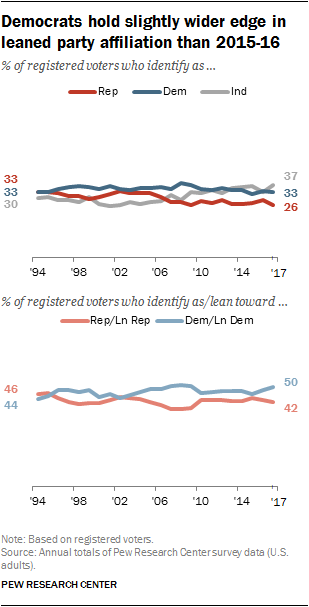 The balance of leaned partisan identification among Gen X voters has been relatively consistent over the past several years. Baby Boomer voters (born 1946 to 1964) are nearly evenly divided (48% identify as or lean Democratic, 46% Republican). The Silent Generation (born 1928 to 1945) is the only generational group that has more GOP leaners and identifying voters than Democratic-oriented voters. About half (52%) of Silent Generation voters identify with or lean toward the Republican Party, a larger share than a decade ago; 43% identify with or lean toward the Democratic Party. 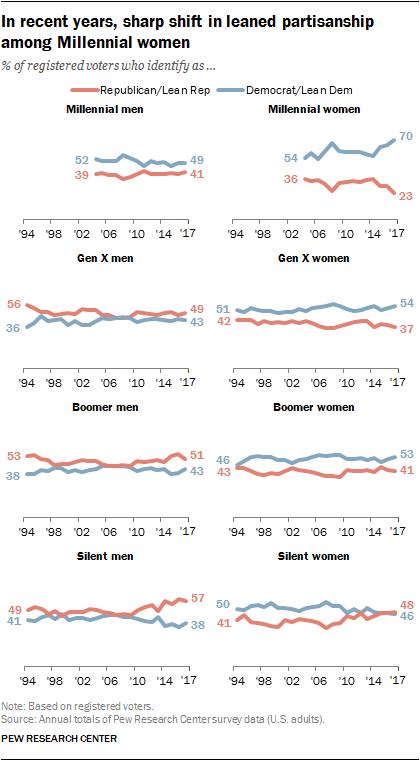 While there is a gender gap in partisan affiliation within every generational cohort, it is particularly pronounced among Millennial voters. A large majority of Millennial women (70%) identify with or lean toward the Democratic Party, compared with 49% of Millennial men. This wide gender gap among Millennial voters is largely attributable to a marked shift among Millennial women. As recently as 2014, the Democratic advantage among Millennial women was a narrower – but still substantial – 21 percentage points, compared with 47 points today. The balance of partisanship among Millennial men was similar in 2014 as it is today (50% Democratic vs. 40% Republican). Gender gaps in other generations are more modest. For instance, 57% of Silent Generation men identify with or lean toward the GOP, compared with 48% of Silent women. Across all generations, nonwhite voters are overwhelmingly Democratic in their leanings, while whites are more divided. Among white voters, Millennials are the only generation in which the share of Democrats and Democratic leaners (52%) is greater than the share of Republicans and Republican leaners (41%). Among older generations of whites – but particularly among white Silents – more voters align with the GOP than the Democratic Party. White Silent Generation voters have moved toward the GOP in recent years. 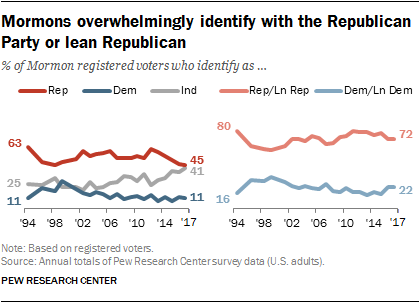 Today, 59% identify with or lean to the GOP, up from 43% a decade ago. White Gen Xer and Boomer voters have remained relatively stable in their partisan makeup in recent years. 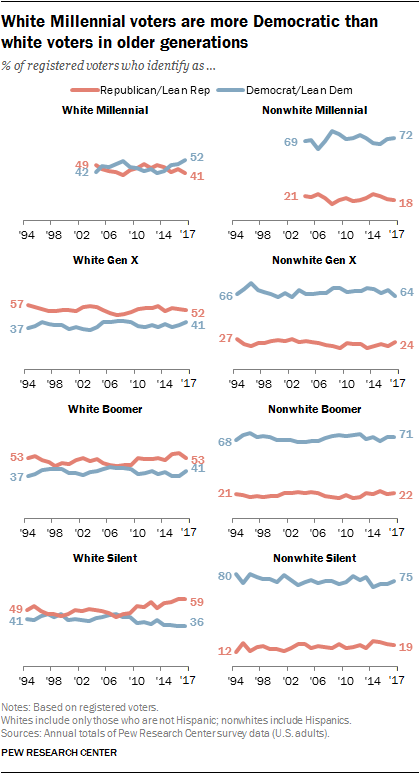 In both generations, the GOP enjoys a similar modest advantage (11 percentage points among white Gen Xers, 12 points among white Boomers); these are similar to the balances in 2014. 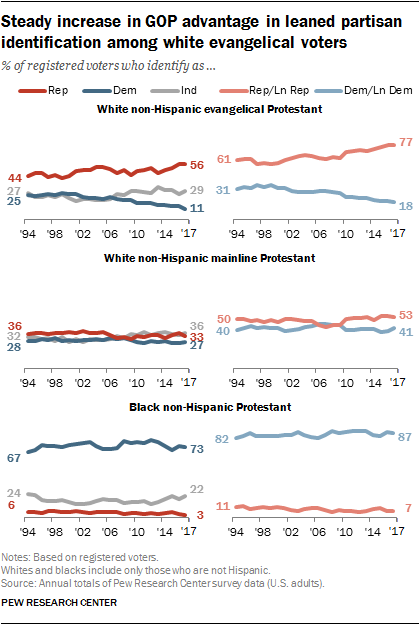 While Mormon voters remain a solidly Republican group (72% overall are Republican or Republican leaning), in recent years Mormons have been less likely to identify as Republican than in the past. Voters in urban counties have long aligned more with the Democratic Party than the Republican Party, and this Democratic advantage has grown over time. Today, twice as many urban voters identify as Democrats or lean Democratic (62%) as affiliate with the GOP or lean Republican. Overall, those who live in suburban counties are about evenly divided in their partisan loyalties (47% Democratic, 45% Republican), little changed over the last two decades. Voters in rural areas have moved in a more Republican direction over the last several years. From 1999 to 2009, rural voters were about equally divided in their partisan leanings. Today, there is a 16-percentage-point advantage for the GOP among rural voters. While there are racial and ethnic differences in the makeup of rural, suburban and urban areas, this overall pattern of geographic divergence is also seen among whites. Among rural whites, the GOP enjoyed a roughly 10-percentage-point advantage throughout much of the 2000s; the GOP advantage among rural white voters is now 24 percentage points (58% to 34%). At the same time, while urban white voters were roughly evenly divided in their political preferences for much of the last two decades, in recent years the Democratic Party has enjoyed a double-digit partisan advantage: Today, 54% of white urban voters are Democrats or lean Democratic, while 41% identify with the GOP or lean Republican.